The independent anti-corruption organisation, Transparency International (TI) Ireland has called on political parties and candidates to commit themselves to introducing reforms and dedicating adequate resources to stop corruption after the forthcoming election. 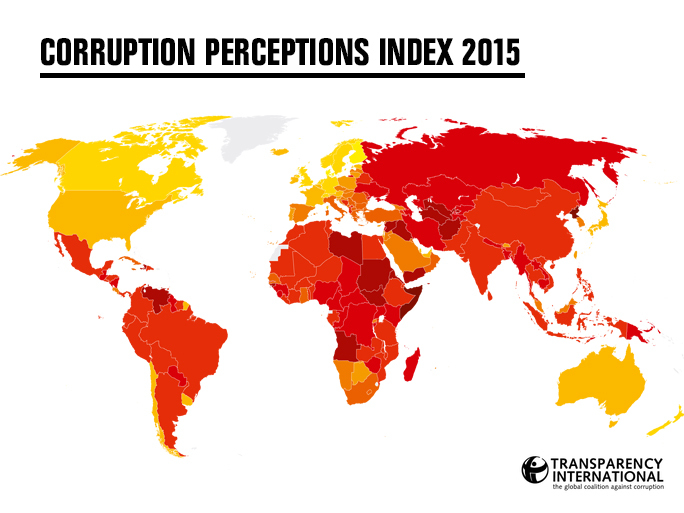 The call comes as Ireland has slipped one place on Transparency International’s Corruption Perceptions Index (CPI) for 2015. The findings published today show a fall in Ireland’s ranking since 2014 from 17 to 18 out of 168 countries, but a slight improvement in its score from 74 to 75 out of 100. 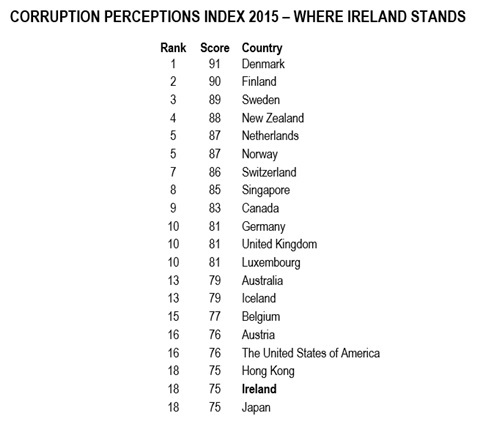 Although Ireland is considered to be one of those countries least affected by systemic public-sector corruption, it is perceived to be far less clean than many of the world’s advanced democracies. ‘Some important reforms, such as new whistleblower protections and lobbying regulations have recently been introduced and will help prevent wrongdoing. However, the failure to publish new anti-corruption legislation, four years after it was announced, is hugely disappointing and should be a source of embarrassment for the Government, said TI Ireland Chief Executive, John Devitt. New political finance rules and reforms enacted in 2012 have an important role to play in helping prevent corruption. Yet we know that people will break the rules. Laws that are not enforced are not worth much more than the paper they’re written on’. The Gardaí and Standards in Public Office Commission (SIPO) have been starved of specialist staff and financial resources to investigate corruption-related offences. If either agency is to investigate corruption properly, they need to see their powers and independence enhanced significantly, and their respective budgets increased ten-fold. Unfortunately, too many members of the Oireachtas don’t seem to realise how big a problem corruption is. If they do know and they’re not prepared to call for reform, then the only conclusion we can draw is that they don’t care’, Mr Devitt added. TI Ireland has also been critical of delays on a decision by the Director for Public Prosecutions on whether court action will follow Garda investigations that were undertaken as a result of the final Moriarty Tribunal report. ‘The apparent lack of action and political ambivalence towards Judge Moriarty’s findings sends the public the message that different rules apply to those in positions of power and influence. This will be deeply corrosive of public confidence in democratic government and our criminal justice system’, said Mr Devitt. Top performers share key characteristics: high levels of press freedom; access to budget information so the public knows where money comes from and how it is spent; high levels of integrity among people in power; and judiciaries that do not differentiate between rich and poor, and that are truly independent from other parts of government. Read our analysis of what Ireland is doing to safeguard its citizens against corruption. The big decliners in the past four years include Libya, Australia, Brazil, Spain and Turkey. The big improvers include Greece, Senegal and the UK. Download the full table of findings here. For the avoidance of doubt, neither TI nor TI Ireland attributes a country's rise or fall on the index to any individual event or individual. TI Ireland operates the Speak Up helpline for whistleblowers, as well as witnesses and victims of fraud, corruption and other wrongdoing. The free-phone helpline (1800 844 866) is open from 10am to 6pm Monday to Friday. The Speak Up helpline will soon be operated by a new independent law centre providing access to free specialist legal advice to anyone making disclosures of wrongdoing. TI Ireland has also recently launched new resources on Responsible Lobbying as well as an introductory video on the initiative.